Garrett Leight Kinney - Matte Black / Blue Layered Mirror Need Help? Kinney is the union between the Garrett Leight Rialto and Brooks models; taking the best of both feminine and masculine qualities from both frames and combining them into one. Simply put, the Kinney is clean, classic, and comfortable. 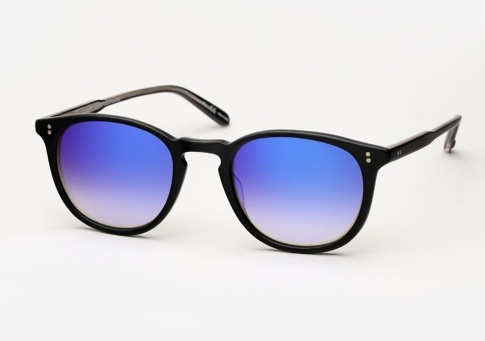 It is offered here in Matte Black with Blue Layered Mirrored lenses. A technologically advanced method was employed for the lenses, whereby a mirror coating is sandwiched between layers of CR 39, protecting the mirror coating from scratches and degradation whilst also creating a unique softer effect.